Application: Protects the face and head of helmet wearer in professional and amateur football. The face mask was converted from a welded wire design. 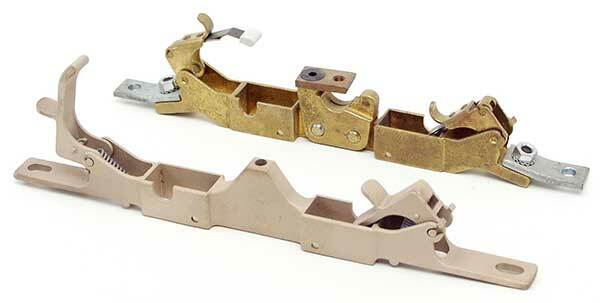 Casting allowed the designer greater flexibility and more creativity than conventional cut wire and welded methods. 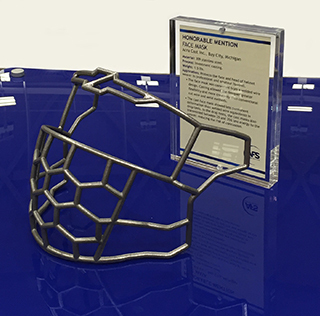 The cast face mask showed less permanent deformation than welded wire equivalents in drop tests. In the drop tests, the cast masks also transmitted between 25 and 35% less energy to the wearer, reducing the risk of concussion. Metal Casting Design & Purchasing magazine recently featured our casting in its May/June 2015 issue. One of the great things about this was the fact that the original part was made in Europe and we brought it to America by making it at a lower cost and with a faster delivery. Cast Component: Size: 7.5" x 7.5" x 4.6"
Application: Bottom heat power distribution in glass forming furnace. Casting Supplier: Acra Cast Inc., Bay City, Mich.
Dimensions: 13 x 1 x 1.75 in. Reduced part count from 35 to 5. Reduced lead times from 5 months to approximately 6 weeks.